Probably the saddest story I have read in the last year. If Shin's mother met her daily work quota, she could bring home food. At 4am, she would prepare breakfast and lunch for her son and for herself. Every meal was the same: corn porridge, pickled cabbage and cabbage soup. Shin was always hungry and he would eat his lunch as soon as his mother left for work. He also ate her lunch. When she came back from the fields at midday and found nothing to eat, she would beat him with a shovel. Her name was Jang Hye Gyung. She never talked to him about her past, her family, or why she was in the camp, and he never asked. His existence as her son had been arranged by the guards. They chose her and the man who became Shin's father as prizes for each other in a "reward" marriage. My position on inerrancy is probably similar to the Chicago Statement on inerrancy. Some complain and quibble that it is pedantic, or leads to twisting Scripture, or has a loose definition of errancy. Part of the problem comes from living in a world which is committed to accuracy, precision, and verbatim quotes. Having a somewhat low context society where much is expected to be spelled out does not help this problem either. But the essence of inerrancy is the claim that the Bible is without error. Specifically it means no errors of fact. The qualifications of inerrancy are around what constitutes a fact. Facts need to be read the way they are intended. One cannot complain that a recorded fact is errant when the author did not make a claim the reader is imposing. We cannot complain that a quote is not verbatim when the author never intended it to be so—which incidentally will almost always be the case when we are translating a quote into a different language. A quote is meant to convey the meaning, exact words are not always necessary. Nor can we complain that a fact lacks precision when the author was not being precise. Approximate details are approximate. Also, just because exceptions and qualifications are not mentioned we cannot assert that there are none; the higher the context the discussion, the more that is assumed. Further, we cannot argue that failure to mention an event means the author denies it happened. My defending of inerrancy is not quibbling, it may be denying your assumptions about the nature of the text. 'How do you know I'm thinking of anything?' asked Curdie. 'Does it follow then that, as you are saying so much, you're not thinking at all?' said Curdie. The Princess and Curdie, George MacDonald (1824–1905). Dennis Prager wrote a commentary recently on happiness, a topic he has written about several times. Here are the qualities he thinks makes for happy people. People who are given little and earn what they have. People who do not see themselves or their group as victims. People who have close friends. People who are in a good marriage. People who don’t have high self-esteem. People who have few expectations. His article expands these statements. Reasonable suggestions. Several are related such as gratitude and lack of complaining, the former can lead to the latter. Having few expectations can arise from contentment which tends to deflect envy. This list reinforces C.S. Lewis' claim that happiness is not obtained if sort directly, but happiness is secondary, resulting from pursuing other things. We are bound by His oath when we accept by faith what He has done. The strength of the oath is His grace. Grace ties the oath tight; grace is not a tier of loose knots. I have read a few blog posts on inerrancy over the years. I think the discussion lacks clarity at times. I have previously given my perspective on the difference between inerrancy and infallibility (as it is now used). I do not think inerrancy is a modern idea, even if the term is more recent. "Inspired" is a difficult term because of the differences people place on the idea. I think a good argument can be made for Jesus' view of Scripture being similar to an inerrant view of Scripture. One complaint is that inerrantists are basically infallibilists once qualifications are taken into account. If one agrees with the qualifications then the term "inerrantist" is still to be preferred as holding inerrancy with qualifications is still significantly distinct from infallibility. It is claimed that definitions can die a death from a thousand qualifications. This can be true, but it need not be true. The problem here not uncertainty over what the specific view (inerrancy) intends, it is because critics of the view raise complaints. It is often easier to critique something than it is to answer the critique, and frequently the answer is much longer. Anyone can make an outlandish claim in a few words. Further they can defend such a claim with brief outlandish reasons. Offering a refutation more substantial than stating a contrary position, i.e. giving an explanation, is going to take more words. Therefore the appropriateness of qualifications does not relate to their number (which is limited to the imagination of the critic) or their length, it relates to their reasonableness. The Chicago Statement on Biblical Inerrancy is one position on inerrancy; one that I think is moderately reasonable. Hopefully I will address some of the articles in the future. I have come across this advice several times, and while it may be of some use to some people, I would like to register my dissension. I believe I first came across this concept from John MacArthur, though cannot remember the context. But he either recommended it or stated that he himself did this; or, quite possibly, both did and recommended reading thru a passage of Scripture multiple times. The rationale of such an exercise was perhaps to commit it to memory, or to better understand the passage in question. I have since come upon this recommendation several times. Jamsco suggested it, Justin Taylor and Joe Carter referenced it. These go back to a suggestion by James Gray in his 1904 book, How to master the English Bible. Variants on number of times thru a book are 30 times, 20 times, as many times as needed to master the book. So I have given this a go. When I first came across the idea I tried James, though not certain if I managed to get thru the full 30 readings. I have also tried it with Jude, Ephesians, and the Sermon on the Mount, Matthew 5-7; getting thru each book or passage at least 20 times. My conclusion, this method is overrated. It may work for some people. If it does, continue. And reading thru more than once has some benefits, not the least being an overview of the book which is sometimes less appreciated when we focus on smaller passages of Scripture. Focused exegesis mindful of a larger context is very useful. But I have not found the reading of a passage multiple times to add significant insight in the 18th or 19th reading. Frankly, 5 times is probably plenty. I think it would be more useful to read the book a few times then come back at a later stage when you have delved into several other books. I am not saying this is a bad practice, or that it won't work for you. Rather this is to temper others' enthusiasm that you will obtain awesome insights on the 20th reading that you missed on the previous 19. I have wanted to do this for a while; writing a post while flying. I am writing from my smart phone as I didn't need my laptop today. There are no issues using a phone in flight as it is a chartered flight and the phone doesn't interfere with the electronics on some older planes (not so certain it's a problem on the newer ones either?). Here's a photo of the sunrise over Otago. Will have to insert it later, blogger won't grab pictures off my phone. What we must have—whatever else we have—is God's forgiveness, or we have nothing. Don Carson, The God Who Is There. An early fragment of New Testament has been found. This was hinted at a month ago and further details have become available. The Mark fragment is "a very small fragment, not too many verses, but it's definitely from Mark," Wallace said. "... To have a fragment from one of the Gospels that's written during the lifetime of some of the eyewitnesses to the resurrection is just astounding." To date, the earliest-known fragment of the New Testament is from John's Gospel and dates from around 125 A.D. The Mark fragment, Wallace said, will affirm what is already written in that portion of Mark's Gospel. The paleographer who dated it, Wallace said, is "one of the world's leading paleographers." Wallace previously said the paleographer is certain it's from the first century. Still, Wallace told Hewitt, several more paleographers will look at the Mark fragment before the book is published. The Mark fragment will be published in a book along with six other manuscripts, Wallace said. One of those will be a second-century sermon on Hebrews 11. The significance: It shows Hebrews -- whose author is unknown -- was accepted early by the church as Scripture. dated by one of the world’s leading paleographers. He said he was ‘certain’ that it was from the first century. If this is true, it would be the oldest fragment of the New Testament known to exist. Up until now, no one has discovered any first-century manuscripts of the New Testament. The oldest manuscript of the New Testament has been P52, a small fragment from John’s Gospel, dated to the first half of the second century. It was discovered in 1934. Not only this, but the first-century fragment is from Mark’s Gospel. 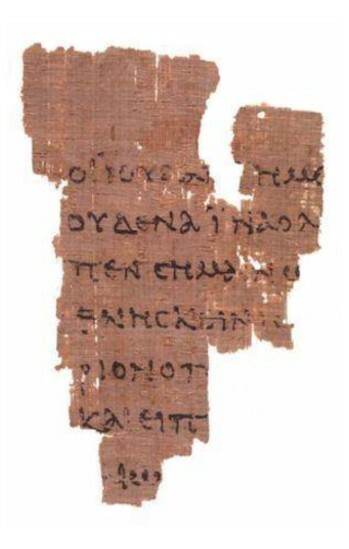 Before the discovery of this fragment, the oldest manuscript that had Mark in it was P45, from the early third century (c. 200–250 CE). This new fragment would predate that by 100 to 150 years. This fragment of Mark is one of 6 manuscripts from the Bible found in this Egyptian discovery. Also found were fragments of Luke and 4 Pauline epistles.